Most people agree that moving is stressful, especially with all the planning, focusing on details, and the actual work involved. Now just imagine how stressful the moving process is for your pets! Because pets are creatures of habit, the upheaval that comes with moving can certainly be upsetting to them. With a little empathy and careful planning, though, you can be sure that Fido, Kitty, and/or any other pets enjoy a relatively stress-free time of moving from home to home. Rapid change is unsettling for pets, especially dogs and cats. When the time comes to start packing and organizing, keep your pets in the loop. Provide them with special places they can hide away from the chaos. Keep a crate in a quiet room. Acclimate them to the crate by giving them food and water in it occasionally while keeping the door open for freedom of movement. Gradually start feeding them in the crate with the door closed. Continue to practice moving them into the crate, and maybe even try taking short car trips with them in it. Don't forget to reward them after their crate-time when they've been "good." All of this will help your pet feel comfortable and safe in the crate, which will save you a lot of headaches as well. 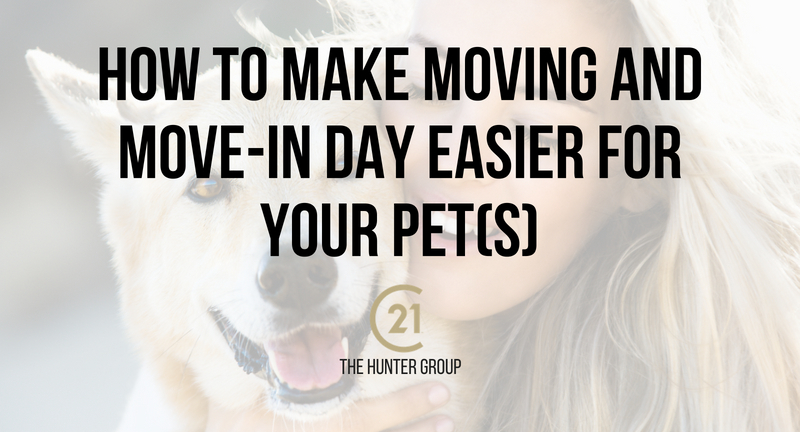 Give your pets plenty of time to get used to the idea of moving. Bring in boxes and materials early. Cats love boxes, right? When doing the actual packing, though, it may be best to keep your pets in their crates in a quiet, room that's already packed. Since they’re acclimated to their crate, that may be the least stressful place for them to be. Definitely make sure they are secure while strangers (i.e., movers) are coming in and out, as an escaped pet search is not a great way to end moving day! Pack your pets’ basic needs separately for a road trip. Put their favorite toys and cushions, blankets etc. in their crate for the trip. Don’t forget to bring their favorite food and treats (plus any medications) for the trip. If your pet is especially stressed by car trips, consult with your veterinarian about ways to keep them calm. Make sure they have up-to-date vaccinations, as well as identification tags with your current contact information. If they have ID chips, be sure the information is accurate there, too. If possible, keep your pets in a quiet place for move-in and make sure to check on them periodically. Maybe you can talk the kids into taking the dog out to explore the new neighborhood! Give your pets lots of time to explore, smell, and otherwise become familiar with their new surroundings. Be careful about giving pets the run of the new house at first though. Sometimes pets may have ‘accidents’ as a coping mechanism. And, with all the activity and confusion, it’s easy for a pet to escape unnoticed. Also be vigilant in making sure that Fido or Kitty hasn’t found an unsecured nook or cranny in which to hide and be forgotten, such as a crawlspace or attic. Pets are family, too! They may be confused about what is going on, so even though you have important matters to attend to, don't forget to give them the attention they need and deserve. It may take some time for them to get used to their new surroundings. You may consider keeping them in a single room with all of their familiar things at first. Spend quality time with them there. If a pet seems skittish or lethargic, it may be due to the stress of the move. Again, take things slowly, keep them comfortable and safe, and they will gradually get used to their new home. Your pet has expectations. While interrupting their usual routine during the move is unavoidable, work on getting back to it as soon as possible. If the move requires new routines, be patient with your pets. Things such as a new time zone and unfamiliar surroundings may throw your pet off. Help them acclimate by spending as much time with them as possible while they are getting used to the changes. Cats, especially, are sensitive to new surroundings, as they may be more ‘loyal’ to places and routines than to people. Keep a keen eye on the kitty, especially if he or she is allowed outdoors. Pets, like people, will have various and unpredictable responses to the stress of moving. Some pets will adjust easily while others may have major anxiety. However, they will respond positively to your making the process as stress-free and easy as possible. Keep your pets’ comfort and safety in mind as you plan and execute your move to make sure that the transition to their new home is pleasant and happy for them and you.